180 designs for screens, room dividers, skylights, cabinet doors, fire screens, & windows for every room in the home. 112 pages, 16 in full color. The second book in the House Tours series. 100 designs for every room in the home. Introduction to the use and power of color, adding dimension and shading with color, and creating a design. 96 pages, 16 in full color. The third book in the House Tours series. 32 pages with full color photos of windows and panels from houses in India, Iceland, Israel, Brazil, Saudi Arabia, Singapore, Germany, Canada and the U.S.A. 50 designs and an intro to sandcarving. 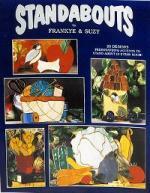 This sequel contains 36 color plates of stained glass and art glass from around the world with 158 color photos and 80 black and white designs. 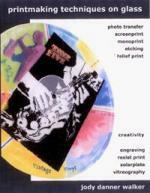 It has a section on the techniques of tracing, staining matting, and enameling. Examples of stained glass art are represented by entries from Saudi Arabia, Brazil, France, India, Israel, Italy, Scotland and New Jersey. 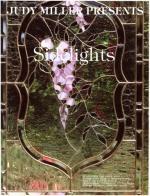 Contains 16 patterns for large sidelights plus 50 sidelight designs with optional stock and custom bevels. Begins with a very thorough introduction which gives valuable advice for designing with color and for choosing subject matter to match the mood of the room. 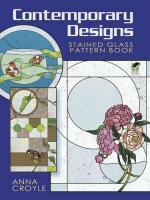 Eye-catching geometrics, abstracts, Art Deco florals, plus instructions and diagrams for window panels, lightcatchers, mirrors, more. Includes patterns in both traditional and contemporary styles all easily adaptable as templates. Designs include landscapes, florals, geometrics, birds, and more. 60 pages. 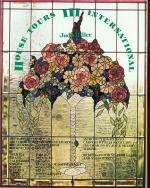 A compilation of winning designs from a stained glass design contest sponsored by CKE Publications. 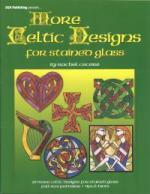 This book contains 43 designs for stained glass panels of all shapes and subjects. Choose from pirates, dancers, masks, women, dogs, abstracts, flowers, horse racing, sailboats, landscapes, birds, and whales. All are shown in full color. by Jennell Hogue 26 full-sized patterns of pin-ups girls and lovely ladies. Each pattern is in jpg and Eye format on the included CD. Ladies include: Subway Marilyn, Rita, Maid, Mermaid, Jayne, Good Witch, Fairy, Art Noveau, Oops!, Betty, Miss Paige, On the Beach, and a couple donning military caps. Large and small panel designs depicting scenes and motifs from colonial to present-day America. Quilts, barn hex signs, steam train, to the walk on the moon, even a 3-D star lantern is included in the 36 pages. 4 pages in full color. Over 90 designs for immediately workable projects: abstract patterns in both straight-line and curve; men and women in characteristic garb from the 1920s; geometrically stylized birds, trees and animals; plus many more. All patterns are perfect for both intermediate to advanced level. 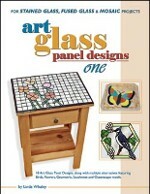 Features 18 full-color, "convertible" designs for Stained Glass, Fused Glass & Mosaic applications, including Birds, Flowers, Geometric, Southwest and Oceanscape motifs. Each of these designs is shown in color, accompanied with 4 illustrations revealing alternative shapes and configurations. 48 pages, 24 in color. 104 beginning to advanced designs of the Art Nouveau era including designs using florals, butterflies, and women. 60 pages, 4 in color. Full-size patterns for 23 varieties of actual butterflies to make into plant spikes, ornaments, and suncatchers. Instructions, color images and suggestions are included. Patterns are provided in three different sizes. 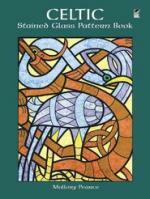 Attractive, practical treasury of 91 patterns adapted from The Book of Kells and other authentic sources depicts fabulous mythical creatures, human figures, stylized birds, fish, sinuous snakes, and abstract designs all incorporating the symmetrical weaves and interlacings characteristic of Celtic art. Perfect for use in window panels, mobiles, lampshades, and other stained glass projects. 12 designs inspired by drawings made by sick children at the Ronald McDonald House. Patterns include Funny Turtle, Little Kitty, Bubble the Fish, Crazy Turtle, Playing in Flowers, and Smile. These quirky illustrations are guaranteed to warm your heart. 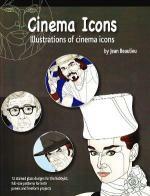 12 lifelike patterns of some of the most recognizable stars in cinema of today and yesterday. Designs include a Brad Pitt, Charlie Chaplin, Clint Eastwood, John Wayne, Marilyn, Paul Newman, Lucille Ball, Steve McQueen, Audrey Hepburn, Daniel Radcliff, Johnny Depp, Woody Allen, Sean Connery (007), and Angelina Jolie. Each pattern is shown in full color and color suggestions are included. Designs can also be used in panels and free-form projects. Glass etching is an art form that can turn a piece of plain glass into a work of art. This practical guide to the craft provides glassworkers with more than 60 attractive, original designs, ideal for applying to dozens of projects. Patterns ranging from nautical themes and Art Nouveau designs to florals, butterflies, and borders are accompanied by instructions for attaining perfect results. Also included is a list of materials needed for making etched glass art at home. Here's a chance for traditional stained glass artists to expand their craft with a dynamic modern look. Mixing abstract shapes with elements from nature, this array of seventy exquisite black-and-white patterns includes "Butterfly Breeze," "Life in a Fish Bowl," "Peonies," and other designs for every taste and occasion. 12 patterns of the most famous icons of Egyptian history. 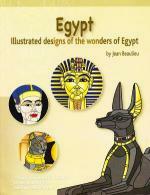 Designs include Nefertiti, Anubis, King Tut, Egyptian Cats, Nekhbet, and more. Each pattern is shown in full color and color suggestions are included. Designs can be used in panels and free-form projects. 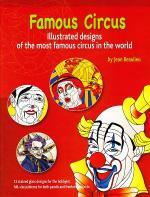 12 patterns of clowns from the traditional whimsical Barnum & Bailey clowns to the mysterious Cirque du Soleil performers. Each pattern is shown in full color and color suggestions are included. Designs can be used in panels and free-form projects. 83 designs — from ancient Egyptian to Art Deco — for workable projects: lampshades, mirrors, ornaments, mobiles, much more. 13 lifelike replications of some of the most famous painting from history. 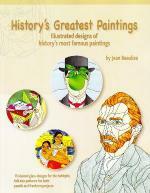 Designs include paintings from Picasso, Van Gogh, Boticelli, Magritte, Gaugain and includes the Mona Lisa and more! Each pattern is shown in full color and color suggestions are included. Designs can also be used in panels and free-form projects. Add a touch of the Far East to your glass craft projects with images from this exotic design gallery. These 71 Japanese patterns were inspired by authentic sources such as kimono patterns and illustrations by Eisen, Hiroshige, Hokusai, Utamaro, Yoshitoshi, and other printmakers in the tradition of Ukiyo-e, "pictures of the floating world." Striking graphics include pictures of geishas, koi, pagodas, samurai warriors, and floral and landscape motifs. 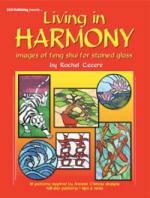 The ancient Chinese art of living in harmony with our surroundings is the inspiration behind this book. Included are 16 full size patterns featuring traditional images of Feng Shui that represent wealth, success, purity, prosperity, happiness, and much more. This collection of 90 original modern stained glass patterns combines abstract designs with natural elements to create strikingly unusual effects. From graceful florals, set amid contrasting bands of color, to an enchanting portrait of an amphibious creature floating among rippling strands, the subjects can be executed with either the copper foil or lead came techniques. 18 designs adapted from The Book of Kells and The Book of Durrow, and original designs. Knot work, spirals and zoomorphics (designs based on animals, birds, reptiles) used to create panels, stepping stones, tabletops or mosaics. Full size patterns, tips and full color photos included. Combining the delicate and tranquil beauty of Oriental design with the luminous appeal of stained glass artistry, this unique pattern book presents 47 exquisite designs. Traditional Asian motifs include cranes, peony blossoms, geishas, and other images, all specially designed to meet the demands of stained glass craft projects from lightcatchers to lampshades. 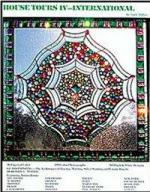 31 stained glass designs of oriental culture including Kabuki, Geisha, fans, and various patterns of origami creatures such as birds, rabbits, dogs, geese, and bears. Full color pictures of each pattern provided. 13 full-size patterns specifically designed to take full advantage of the South Beach Frame, an innovative bracket designed by the renowned lampbase maker Handley Industries, that enables crafters to easily mount and illuminate their art glass on any wall. The designs have a decidedly art deco flair that is reminiscent of the architectural style found in legendary South Beach, Miami Florida. 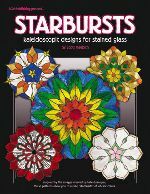 A 5 page instruction section is included that features tips for using and adapting the patterns for stained glass, fused glass and mosaic projects. Details more than a dozen different techniques, with step by step instructions and inspirational works by the artists. Techniques covered range from photo transfer and screenprint to etching, engraving, relief print, resist print, monoprint, and more. In addition to a chapter on Creativity, the book also includes sections on solarplate and vitreography, as well as topics such as mixing paint, health and safety and firing schedules. Red Hats are everywhere…and now you can make a red stained glass hat for yourself or your "red hat" friends. Some of the full-size patterns are fancy and frilly; others are simple and can be embellished with feathers, beads, fabric, ribbon or whatever strikes your fancy. 18 full size patterns for CLASSIC CARS and TRUCKS. Designs include Ford Thunderbird, Pontiac GTO, a Woodie, Volkswagon van, and more. The GLASS CLASS section offers complete instructions on how to choose the right glass and create realistic automotive details for your project. Add braces to the back of these projects and they will stand alone on tables or mantles. Great gifts ideas. Projects include jumping fish, toolbox, birds, fruits and vegetables. When you look into a kaleidoscope, you experience a beauty created when a small design mirrors itself into an amazing burst of color and movement. You can now recreate these magical images with these patterns. Each of the 11 full-size patterns is about 24" in diameter and will fill your window with a bright splash of radiant colors.